FAIR WARNING: This review contains a hell of lot spoilers. I’m sorry, but this is pretty much unavoidable, as there are structural issues I want to discuss here, and to understand them I’m going to have to describe the plot of the book. So, if you want to read The 5th Wave with any sort of suspense, you might want to hold off reading this review until afterward. ‘Nuff said? The 5th Wave is an alien invasion story. Refreshingly, the invasion does not involve death rays destroying iconic architecture or jet vs. star-fighter dogfights. Instead, what happens is a calculated series of attacks on populations and infrastructure. In the first wave, an EMP weapon fries all electronic devices running on microchips, everything from cell phones and the computers to automobiles and airplanes. In the second wave, multiple tsunamis–created by gigantic metal rods dropped from orbit onto Earth’s fault lines–inundate the world’s coastlines, killing 40% of the population. In the third, a plague carried by birds kills 97% of those who remain. In the fourth, alien ‘Silencers’ implanted into human beings hunt down those immune to the plague, ending trust and cooperation between survivors. Yancey’s novel contains two main point-of-view characters. The first is sixteen year old Cassie Sullivan, and the first hundred pages or so belong to her. Once your typical high school girl, we first find Cassie weeping and shivering in a tent in the woods, clutching a battered teddy bear and an M16, a complete emotional wreck. Cassie has lost her entire family: her mother, her father, and her five year old brother, Sam. Through journal entries, Cassie introduces the world of novel and gives her backstory. This first portion of the novel ends when Cassie is shot by a Silencer sniper. Subsequent Cassie sections detail her peculiar escape and her subsequent rescue by Evan Walker, a taciturn farmboy who has also lost every member of his family, girlfriend included. While Cassie recovers from her wounds in Evan’s family home, she vacillates between trauma-fueled suspicion and a growing affection for her quiet, able host. Unfortunately, evidence begins to mount that Evan is not exactly what he seems to be. Could he even be the man–the thing–that shot her? All of the above makes for a pretty satisfying narrative, full of suspense and emotional turmoil. Though certainly derivative of Jack Finney’s The Bodysnatchers, these first few Cassie sections are my favorite portion the book. Yancey’s second protagonist is Ben Parish, a former high school football star who has also lost everyone he ever loved, not to the plague or the Silencers, but to human looters. Ben is further haunted by his panicked abandonment of his little sister, a failure he can never forget. Plucked from a tent city outside Wright-Patterson Air Force Base, Ben and other children–some as young as six and seven–are trained to be soldiers. Ben throws himself into his new role, seeing it as a path to redemption. But when Ben’s unit finally takes the field, it becomes clear that the ‘infested’ humans they’ve been sent to kill are simply human beings, which means the officers who sent them may very well be the enemy. Again, these early Ben sections tell a compelling story. Here too, I’m reminded of another author’s work–in this case Orson Scott Card’s Enders Game–but, like Cassie’s, Ben’s story stands on its own merits. No, Ben Parish isn’t the problem. The 5th Wave breaks down, in my opinion at least, where the Ben and Cassie stories intersect. That point of intersection is Cassie’s brother Sam. Far from being dead, Sam ends up training alongside Ben at Wright Patterson, now rechristened Camp Haven. Both Cassie and Ben vow to get him out of Camp Haven, and their overlapping rescue attempts occupy the book’s final pages. Where the majority of the novel puts familiar alien invasion cliches to new and interesting uses, the climax is just cliched. Air ducts large enough to admit human beings penetrate the supposedly ultra-secure Camp Haven, leading to places like the armory and the control center. There is a final showdown with the alien commander, Colonel Vosch, which fails to end decisively only because there are sequels still to come. Finally, there is the James-Bond-style destruction of the base, with our heroes barely escaping giant explosions and a massive, fast moving sinkhole. For a book that began so promisingly, this is a dismal end. The 5th Wave also suffers from a certain thematic muddiness. If this books has a message, it is not conveyed clearly. Part of this is faulty technique. Yancey repeats a number of phrases and sentences throughout the narrative in order to lay out possible responses to the invasion. There are simply too many of these. The survivors are compared to both cockroaches and to clay. The reader is told that only the ruthless will survive, then exhorted to see each remaining life as precious. Worse yet, these key phrases are often put into the mouths of wildly different characters–some of whom spend the whole book apart–and given brand new meanings. The end result is not enlightenment for the reader, but confusion and annoyance. None of which is to suggest that The 5th Wave is a bad book. It is simply not as good as it might have been, which is a pity. Yancey can do better than this. One benefit of the hype surrounding The 5th Wave is that it has convinced Simon & Schuster to publish The Final Descent, the fourth and final volume of Yancey’s Monstrumologist series. (Due out this September) These historical horror novels tell the story of Will Henry, unhappy orphan and reluctant apprentice to Pellinore Warthrop, a scientist who studies–and occasionally battles–monsters. 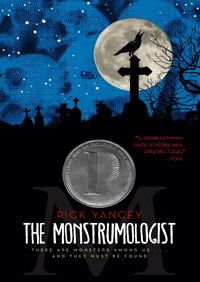 Though never bestsellers, The Monstrumologist and it’s sequels are superior to the more commercial 5th Wave. They are more frightening, much more gory, and more deft in their treatment of theme and character. In short, they are Yancey’s masterworks. This entry was posted on June 2, 2013 at 6:42 pm and is filed under Book Review with tags Child Soldiers, Ender's Game, Invasion of the Bodysnatchers, Monstrumologist, Rick Yancey, The 5th Wave, The Birds, YA Apocalypse. You can follow any responses to this entry through the RSS 2.0 feed. You can leave a response, or trackback from your own site.